The airplane landed high and fast at the Del Rio airport's runway 13, which is a 5000 feet (1524 m) asphalt runway. Preliminary radar information revealed a ground speed of 190 knots over the approach end of runway 13, where the Vref landing speed should have been 116 knots. Eyewitnesses reported that the plane touched down past the intersection for taxiway Charlie, which is located about 1,875-feet short of the departure end of the runway. Breaking action started 630 feet further on. Apparently the aircraft could not be brought to a halt and overran the runway end. The jet plunged off the south end of the runway, crossed Johnson Boulevard and plowed into the Masonic Cemetery where it burst into flames, approximately 1,600 feet beyond the departure end of the runway. PROBABLE CAUSE: "The pilot's misjudged distance and speed during the approach to landing, and his failure to obtain the proper touchdown point resulting in an overrun. 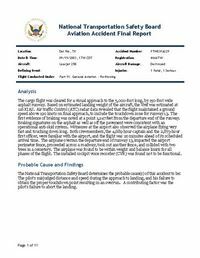 A contributing factor was the pilot's failure to abort the landing." Distance from El Paso International Airport, TX to Del Rio International Airport, TX as the crow flies is 584 km (365 miles).